One day young Nika wakes up to discover her closet is bare. Upon discovery of her empty wardrobe her hangers gleefully announce that Nika's clothes have had enough of her mistreatment and have decided to run away. It seems Nika has cared for her clothes quite poorly. But as Nika laments the loss of her favorite clothes she looks around her room at total disarray. With toys stacked upon one another in chaotic disorder, she is struck with a terrible thought. What if her toys were to decide to leave her as well? With a little help from her friends Sun and Wind, Nika learns a valuable lesson about treating her things with respect. 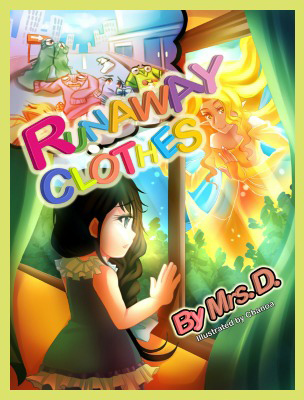 Runaway Clothes has earned the Children's Literary Classics Seal of Approval and is recommended for home and school libraries.